This past weekend the Lower East Side played host to the New Museum’s Festival of Ideas. I pride myself on always trying to see as much art as I can but the catalogue of events, exhibits, booths, and vendors associated with the Festival of Ideas was overwhelming and intimidating. Friends that I ran into that evening told me “their Idea was to leave”, which I can completely understand. But being the masochist that I am, I tried to see it all, and below are some of the highlights you might of missed. The Festival of Ideas featured hundreds of events from a keynote address by Rem Koolhaus and academic panels to gallery exhibitions and a street fair/block party that stretched down the Bowery from Houston to Spring Street and back up Chrystie and Forsyth. This street fair featured everything from booths that taught passersby how to make their own compost to another advocating for “Meatless Mondays”. By far the most engaging stop around the block was at the Bushwick Art Park organized by Trust Art and Factory Fresh. These artists’ work was in it’s element on the street with crowds of people delightfully engaging with it. 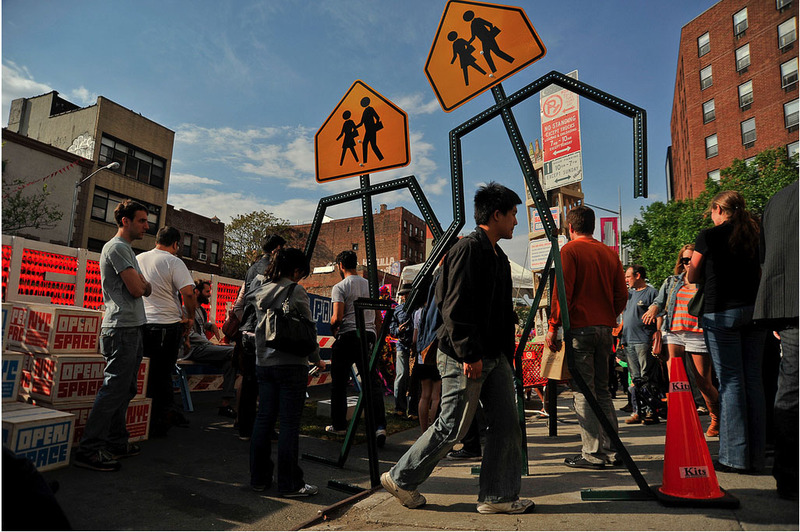 After countless booths of eco-friendly propaganda, Leon Reid IV‘s monumental stick figure sculpture of two pedestrian crossing signs holding hands was jarring, humorous, and made viewers experience street signage like never before. 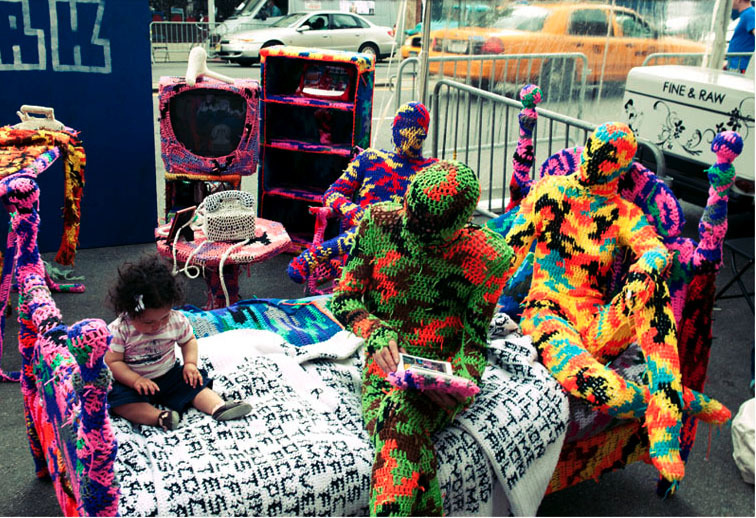 Another artist, Olek, takes knitting to extremes creating a world out of a needle and yarn. Tricycles, bicycles, and even a Volkswagen Beetle covered in yarn could be found parked around the city. For this event Olek unveiled an entire bedroom covered in yarn with a cast of characters in head-to-toe bodysuits that were both terrifying and disarming at the same time. Another fun showing came from the organization Art in Odd Places. 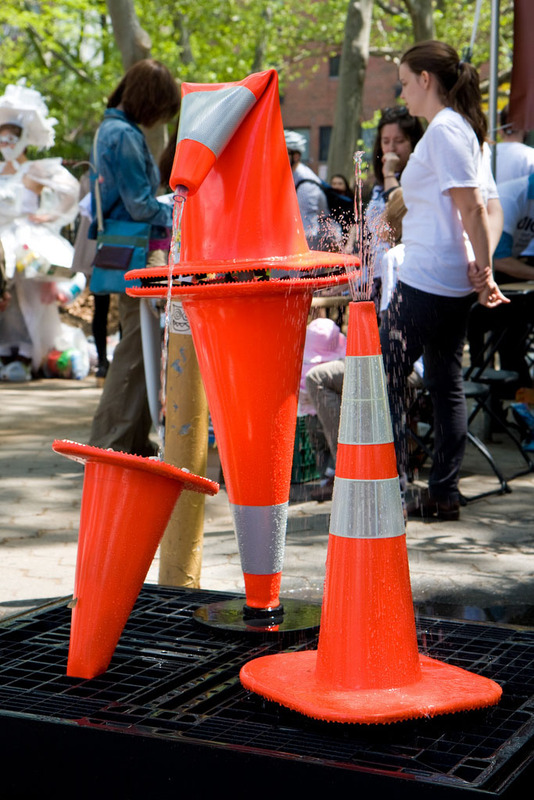 Like Leon Read IV’s sculpture, Tim Thyzel pulled objects from the urban vernacular creating a fountain out of orange traffic cones. 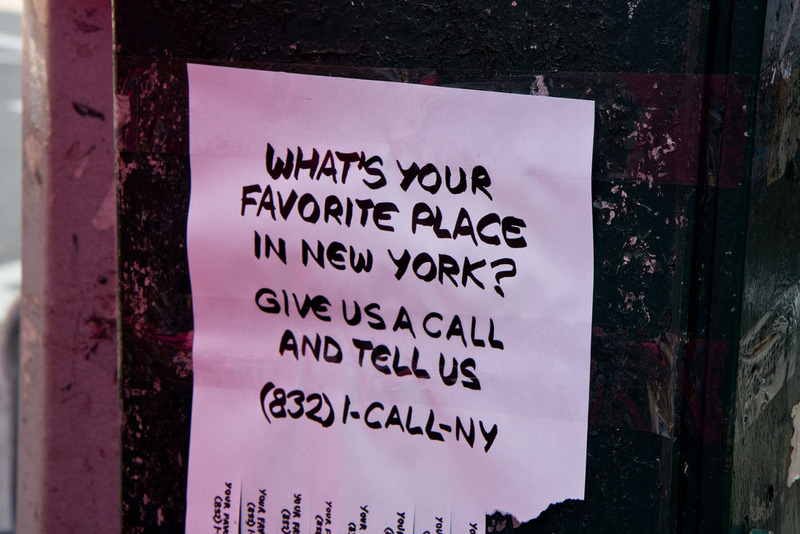 A group that goes by the name Concerned New Yorkers created a hotline (832) I-CALL-NY where anyone can call up and leave a message describing their favorite place in New York. A Google Map on their website charts all of the locations which you can click on to listen to the message describing the site. In the street fair/block party setting it was challenging for attendees to focus on any one thing with so much else going on around them. What stood out were works that were fun, playful, and incorporated the familiar seen in a new light.